The Darkness is growing but the Spook and his apprentice Tom Ward, both seven sons of a seventh son do this time when the dangers come from the witch country itself? Well read on to find out what happens next in The Wardstone Chronicles #4 The Spook's Battle by Joseph Delaney. Warning: Not to be read after dark. 'I see your future clearly. Your master will be dead and you will be alone.' The Spook and his apprentice protect County from the dark abut now a terrible danger threatens. The witches are rising and the three most powerful clans are uniting to conjure an unimaginable evil - the Devil himself. If they succeed, will Tom and his master have the courage and cunning to defeat the most powerful enemy of all...? In the course of the three previous books Tom has faced a lot of dangerous things, ghosts,old gods, vicious monsters, boggarts, dead witches and the like and came out victorious from them all but with heavy duty damages to himself and his associates. Not going to into details you might as well check my reviews of the previous three books here (click here to see the reviews). But this time the dangers come from something close, the witch country of Pendle. This time the danger comes from his friend Alice's home country. Yup, i'm sure you guys remember that she is a witch (those pointy shoes are a dead giveaway). So, the Spook, Tom and Alice set out to Pendle and be done with the witches once and for all but its not at all an easy task as the threat this time is more closer to home and on a much greater level than they ever imagined. The question remains can they prevent the doom that they witch clans are about to spring on them and more importantly can they come out of it in one piece? That is the question that remains to be seen. 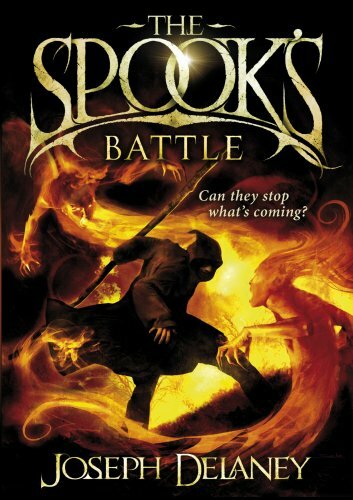 On the whole The Spook's Battle is another well written chapter of the Spook and his apprentice Tom's life. Exuding an ounce of the creepy and a great sense of mystery. As the previous three books this time around again the fight is to the death and both the Spook and Tom are at their wit's end trying to battle the ever growing darkness. Tom, this time around shows a level of maturity that he never had before and the Spook himself battles the nuances of old age. This is definitely one book you don't want to miss out on, trust me! "Do the Spook and Tom have it in them to fight - when this time around the enemy is the dark made flesh himself?"